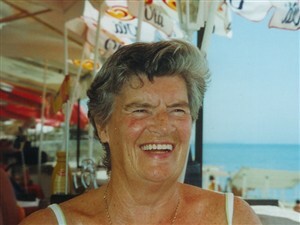 EBB member Carol Thomson died on the 14th June 2005, exactly one year ago today. Most of the following text is the Celebration of a Life that was read by her close friend and companion Rev Gerald Coates, who conducted her funeral at the Church of St John the Baptist on 30 June 2005. Carol Lynne Yearsley Thomson was born in London on 7th January 1937 to William and Kathleen Thomson. Within two years the War started and she went down to Tonbridge to stay with an aunt, but soon after the family were united in Rottingdean where her brother, Bill, was born a year later. She went to school at the local convent at Rottingdean and then on for her secondary education at Effingham Convent. Leaving school she went to London for a secretarial course, and finishing with flying colours had several good secretarial jobs. In 1963 an opportunity arose and she joined the P&O Lines becoming the entertainment officer on ships going to Australia and cruising around Australasia. This was exhausting work so on return to England she joined Burmah Oil and became a Personal Assistant to one of the directors. As a result she got to Oil Rigs and represented Burmah at the Canadian Olympics among many other interesting assignments. 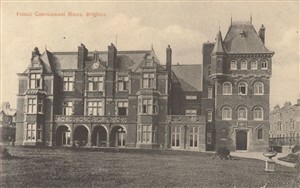 She moved with Burmah down to Swindon until her Mother died in Brighton in 1973. Taking early retirement, she came to live in her mother's house. Back in Brighton she quickly found employment with KTM in Patcham and then moved on to Allied Breweries in Dorking. Needing something nearer home she met with two Nurses who founded an agency - Age Care - putting people needing residential care in touch with homes and vice versa. 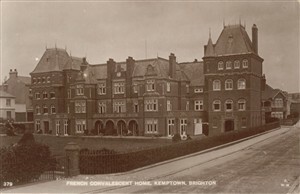 Dealing with people in need was right up her street and eventually she took the post of Manageress of the French Convalescent home in Kemp Town. Sadly this closed a few years ago and she put her gifts to work on the wider Brighton scene. She joined the Whitehawk Inn Training Centre and having learned the ins and outs of computing, joined the staff as a volunteer to help the elderly to come to grips with modern technology. She was instrumental in enabling a severely disabled young man to get a state-of-the-art computer and for him to become proficient in computing skills. Always conscious not only of the elderly and disabled but those who look after them, she joined the Brighton Carers group, was a trustee of St George's Crypt and Secretary for Christian Aid. Meeting the Sea Cadet Corps she used her skills to raise the money for the cadets to acquire their own Minibus. Becoming a member of the U3A her secretarial skills were latched onto right away and she became the Chair of the Brighton and Hove U3A. Her passion for local history made her the natural leader of the U3A local history group, meeting each Tuesday morning at St George's Crypt in Kemp Town. Never at a loss for new ideas she also joined the East Brighton Bygones local history group. Her gifts were soon acknowledged by the parish and she became the Chairman of the Parish Council and was actively involved in the social and caring side of parochial work. Carol hosted an ecumenical study group in her home each month and as a lay minister of the Eucharist was able to take communion to the sick and the housebound. She masterminded the celebrations for the Silver Jubilee of her parish priest Gerald Coates and, incidentally, she operated in like manner for his 40th and 50th. 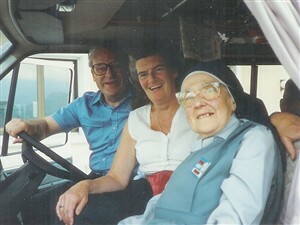 Each year for 17 years Carol was the secretary to groups of elderly and disabled on pilgrimage to Lourdes. 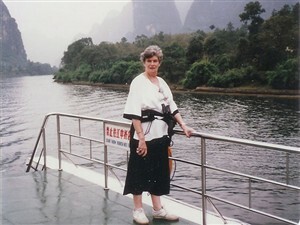 She first visited in 1983 with the Diocesan Pilgrimage. From 1988 she helped organise a pilgrimage every year for Senior Citizens who stayed just outside Lourdes in a custom-built hostel for the disabled called Hosanna House. The Trust was formed to take children to Lourdes at Easter each year and in its first year, 1957, there had been 43 children. By 2006 that number had risen to 2,050 children. She had time, too, for holidays with a difference - China, Vietnam, Thailand, the Greek Islands, Croatia, the Maldives, the Canaries, an African safari, Canada, a train across the USA, you name it! But she never reached South America, or even Ireland, but I bet a year or two more would have seen her in those places. Carol was very fit - she was down at the David Lloyd Sports Centre two or three times a week for a work-out. A visit to the GP showed up a slight heart problem. After intensive investigations she ended up in the Sussex County Hospital for a heart valve replacement, she caught an infection and six weeks later underwent a second valve replacement. Recovering from this, she had a thrombosis and died suddenly three days later of a severe bowel infection. Carol was known to many priests, deacons and lay folk around the diocese. Over 250 people who had been touched by her in some way or another came to her funeral at the Church of St John the Baptist, Kemp Town, Brighton and it was her wish that you should pray for her that we all meet merrily together in heaven. May she rest in peace. This page was added on 13/06/2006.